Granite rocks from stone quarries in the mountains were placed along the edge of the road to prevent it from being swept away. 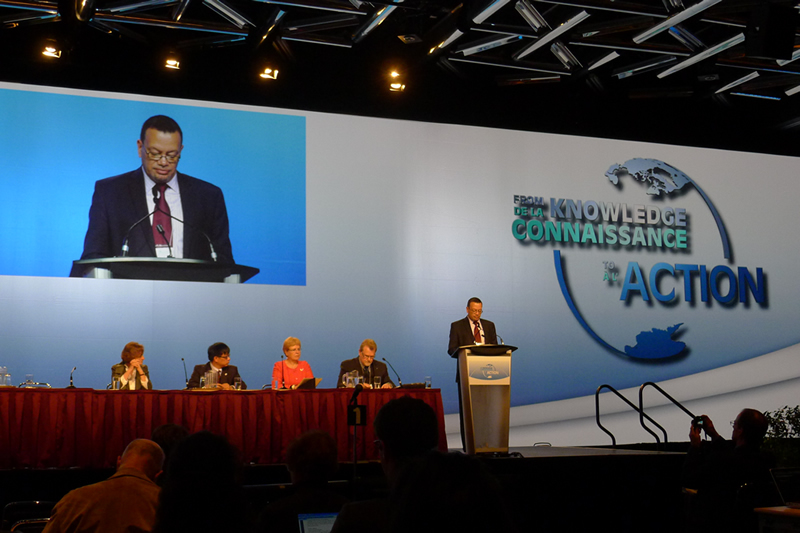 One of the highlights of the recent IPY 2012 "From Knowledge to Action" conference in Montreal was the impassioned speech by Ambassador Ronny Jumeau of the Seychelles. He spoke about how the people of the Arctic and those of small island nations are coming together to voice their shared concerns about the impacts of climate change on their environments and livelihoods. SciencePoles caught up with Abassador Rony Jumeau during the recent IPY conference in Montreal and asked him about the links that exist between the people of the Seychelles with those of the Arctic, the different ways in which small island nations are being affected by climate change, and what legal options remain for tackling international lethargy regarding the fate of small island nations. Why did a representative from the Seychelles attend an International Polar Year (IPY) conference? For some years now I have been working with Many Strong Voices, which is an alliance between the indigenous peoples of the Arctic Circle (from the Inuit of Canada, Alaska and Greenland, to the Sámi of Sweden, Norway, Finland and Russia) and the Small Island Developing States (SIDS). The first thing that we have in common with the people of the Arctic is that our voices are small, in the sense that we are very small communities. Secondly, our regions are among the most sensitive barometers of global environmental change, and we are amongst the most vulnerable people in the world facing this change. Our societies and livelihoods in both the Arctic and the SIDS are especially vulnerable because of our close ties to both land and sea environments. Unlike us, however, the people of the Arctic often feel that their points of view are not represented as vocally as they could be by the governments that preside over them. Since we island people have our own governments that are able to speak about our shared concerns, they felt it useful to join forces with us. And since we also know that what happens in the Polar Regions does not stay in the Polar Regions, we readily accepted. The way the poles go is the way we go. Hence, it is also in our interest to champion the cause of the Arctic people, and to speak out for them as best we can. We share their pain and fears, and by helping them, we are also helping ourselves. Can you describe how the Seychelles are being affected by changes in the Polar Regions and eleswhere on the planet? Naturally, the most publicized impact is sea level rise as a consequence of melting ice sheets and other land ice masses around the world. In the Seychelles, we now have to blow up our mountains to get hold of the rock and granite we need to protect and save our beaches. This is obviously critical if you have marine-based tourism as we do. But it’s not just the melting of land ice that’s the problem. Even melting sea ice affects us. Stripped of ice, the darker seas are absorbing more heat rather than reflecting it, and this has repercussions right across the globe – for example through the changes it imposes on ocean currents. Whilst island nations may be among the smallest countries in the world, many of us have huge ocean territories, and in the Seychelles as in other islands, rainfall is completely dependent on the ocean. The severe and unprecedented drought which we are currently experiencing means that something is already wrong with our oceans, and this in turn is linked to what is happening in the Polar Regions. 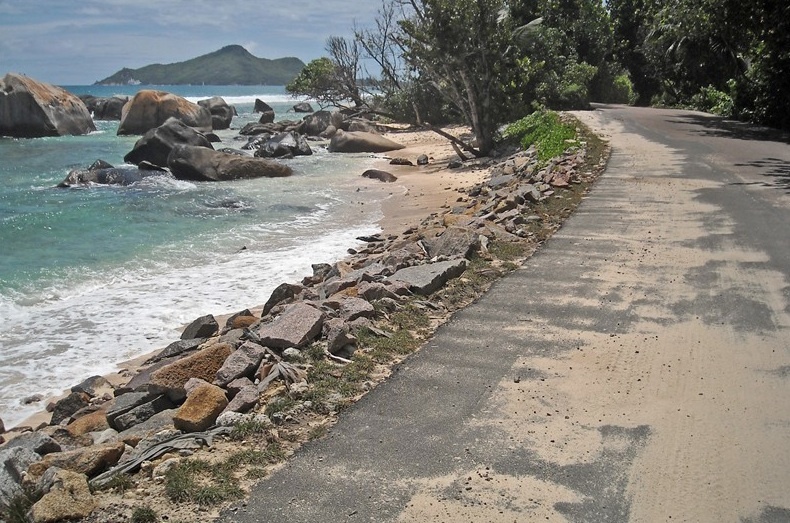 How is the drought affecting the population and the environment of the Seychelles? To start, I should explain that we have two seasons in the Seychelles: The rainy season – which until now, has run from October to May – and a dry season – which traditionally runs from June to October. The inhabitants know the dry season is turning into a serious drought when the authorities announce two things: The first is that water restrictions are being introduced, meaning that piped water supplies to the population from our dams and reservoirs will be cut to a few hours a day. The second is that a ban on lighting fires is being imposed, for fear that one might get out of control and spread to our beloved forests right when there is a shortage of water to fight brush and forest fires. Of course, drought affects everything: Manufacturing, tourism, food security, and ordinary families. And because there is very limited space to build more dams, we are having to turn more and more to desalination plants which, first of all, are extremely expensive, and secondly, run on fossil fuel. Naturally, this in turn increases our fossil fuel contribution to climate change… It’s a vicious circle. What’s more, as it gets hotter and hotter, we are also making more use of air conditioning. Once again, this means more electricity, and more fossil fuels being used until we can shift to renewables. This is something we are trying to do faster and faster as our fuel bills rise ever higher. To what extent are the economic effects already being felt? We have had to take on more debt. And although I sometimes say that if the land ice melts, we drown, I personally think that some island nations will become failed states and see their economies collapse before the sea runs over them. The reality is that sea level rise is not the most pressing problem right now. Today, we are more worried about what happen to tourism and other industries. Because many small island nations are middle income nations - and the Seychelles are upper-middle income - we have had to borrow on the international market and, whatever people think, we do not get preferential access to financing as victims of climate change. So these are the effects and complexities we are facing. One thing to understand about climate change is that it is cross cutting. You cannot discuss, negotiate, or tackle climate change in a vacuum. Although this is especially true for small island states, it applies to everyone: Food production, food security, health, infrastructure, transport, energy… Everything is affected. With so much at stake, and despite the future climate change that is already built in due to current atmospheric CO2 concentrations, is Many Strong Voices considering legal action as a means to limit damages? In short, yes. As well as Many Strong Voices, we now have a group called ‘Ambassadors for Responsibility for Climate Change’, which was born out of conversations at the United Nations. It originally included myself and other Ambassadors from Pacific small islands states, but is now expanding to include other severely affected nations such as Bangladesh. Our original aim was to take our cause to the International Court of Justice (ICJ), but we soon realized that if we went straight there, many powerful nations would swing into action to try and stop us. So what we are trying to do instead is to get a resolution passed in the UN General Assembly, maybe as early as June 2012, asking for an advisory opinion of the International Court of Justice on the responsibilities of states that emit greenhouse gases and harm other states. In international law, there is a principle that a country cannot do things within its borders that harm people across them. For instance, you can’t just dam a river upstream of a neighboring country into which it flows. You have to negotiate first. Of course, this principle has never been used for climate change, and at the moment we are just asking for an advisory opinion, as this is hopefully the avenue of least resistance. It’s a general legal question, and we are not pointing fingers. But we know the politics of climate change, and they are getting us nowhere. We also know that it costs less to tackle climate change early, rather than to adapt to it later. We know that the science is very clear, and we know that it is morally wrong to do something that will affect other countries. So we say: “Let us engage in the legal debate.” In our opinion, this is a valid request. But first, the International Court of Justice will have to agree that climate change is caused by human activity? That’s right. For the first time, the ICJ will have to agree that climate change is caused by human activity, and it will have to address the issue from a legal standpoint. And of course, this will require having access to, and basing their work on, the latest scientific evidence. So in effect, through asking one question, we are trying to get two answers. If the judges satisfy themselves that climate change is caused by human activities, then governments and industries necessarily become responsible. What we are trying to do is to add another dimension to international debate. In effect, we are trying to get the international legal community to talk about climate change in the same way industry talks about climate change. This could in turn provoke something of a paradigm shift in the way we address climate change internationally. And what do you do if big emitters come back and accuse you of emitting as much as the next guy on a per-capita basis? Well, we can’t ask for everything on our side, can we? We are ready to bite the bullet. We have never denied that we are also responsible for climate change. We have never seen it as a divide between North and South. We have always said that everybody needs to take action, and we are trying to lead by example in our shift to renewable energy. Let’s not wait for the others to do it. Where we can do it, let’s do it. That is our thinking. After five years as Ambassador of the Republic of the Seychelles to the United Nations and the United States, His Excellency Ronny (Ronald Jean) Jumeau was appointed roving Ambassador for Climate Change and Small Island Developing States issues in 2012.